Elections are held at the Fall River Municipal Building, 641 S. Main St. Polls open at 7:00 AM and close at 8:00 PM. The building is handicapped accessible. Contact the Clerk's office to obtain absentee ballots. Download an informational brochure explaining important facts for registering to vote. Download a voter registration form. This form is used for new voter registrations, address changes and name changes. 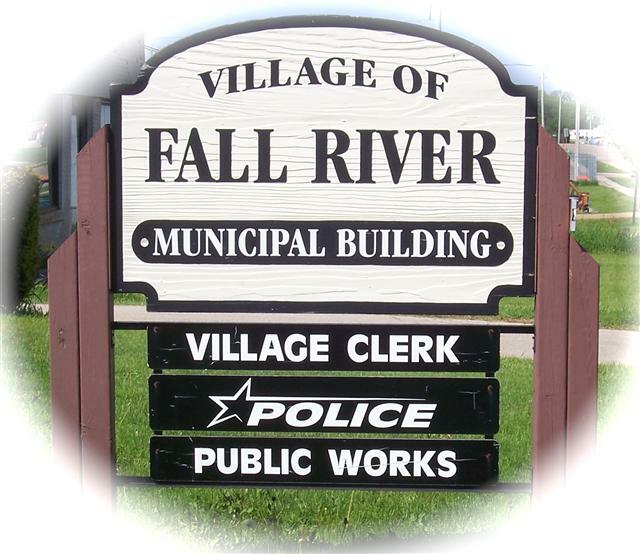 Village of Fall River residents are billed monthly for water, sewer and garbage collection. Utility customers who do not make payment before the due date listed on the billing will receive a ten-day disconnect notice. Payment must be made within ten days to avoid having water service disconnected. It is illegal to discharge clear water from a sump pump or downspouts into the sanitary sewer. Doing so burdens the sanitary sewer collection and pumping system and can result in increased operation, maintenance, and treatment costs. Excessive discharge of clear water into the sanitary sewer can result in sewer backups and damage to property. Discharge of clear water should be directed in such a way as to avoid being a nuisance or danger to others. The following utilities serve the village of Fall River. Please contact them directly to have service started or changed to your new address.